This entry was posted on Wednesday, January 20th, 2010 at 1:53 pm	and is filed under Gluten-Free Recipes. You can follow any responses to this entry through the RSS 2.0 feed. You can leave a response, or trackback from your own site. Looks decadent! I tried to make hot chocolate with hemp milk the other day, and maybe I just need to get used to it, but it just wasn’t the same. I do love the addition of the orange extract in yours though! Mmmmm….perfect for the snowy week we are in midst of enjoying. Come to TAOS and we’ll serve it up in the groovy skier/winter oversizesd mugs you gave me! This looks perfect =D. Love the extra flavours – YUM! Chocolate, orange, and cinnamon … sounds like a liquid version of the flourless chocolate orange cake I made recently! Oh, wait, cayenne pepper … I didn’t include that, but maybe I should have. This sounds great, Melissa. Looks fabulous, dear. Especially on this cold sleety day. Funny you mention hemp milk as I have never been fond of that either. I like hemp protein or the seeds, but not the milk. And yes, the orange extract really punches up the hot chocolate. How was the Food Show? I would love to go to one of those. I don’t mind Stevia, but I don’t use much of it and I’ve never baked with it. My mom says it tastes bitter, but I don’t notice that. OH my gosh, how I wish I was in Taos right now. Skiing with you and then following it up with a hot toddy at the St. B. I can hardly read my Taos Facebook updates anymore. I know you’ve gotten about 4 feet of snow this past week. It’s sunny and 45 here right now. Wish I was there! Thanks for the comment and yes, the extra flavors make it extra good! I found your comment in my spam folder again. What’s with that, anyway? It’s not like you have a risque blog name or anything. You and your flourless cakes! Loved the sound of that last one of yours. Yes, orange and chocolate are meant to be together! 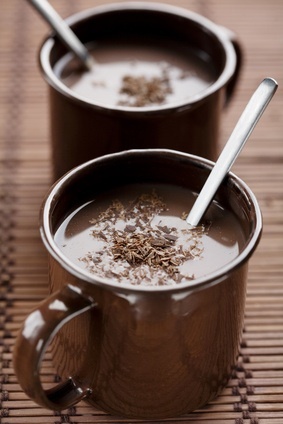 Love the orange and cayenne in this hot cocoa! Bet it would be divine with coconut milk as well! Who was it that said, “chocolate soothes the savage beast”…? Sounds divine!